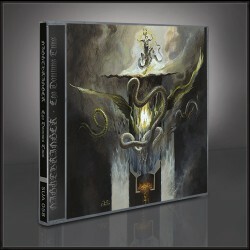 Enigmatic black metal cult NIGHTBRINGER have summoned forth its' long-awaited new album 'Ego Dominus Tuus'. 'Ego Dominus...', Latin for "I am your master", is as imposing and commanding as its' title suggests. Recorded by the band and Dave Otero (COBALT, CEPHALIC CARNAGE), 'Ego Dominus...' is an epic piece of ritualistic metal so dense and so regal that it's magic will continue to manifest for years to come. 'Ego Dominus Tuus' is a monument to black metal at its most powerful, and one of the finest genre works to emerge in many years. Believe in the power of death!